George Packer has written a brilliant piece on the rise of Germany’s Chancellor Angela Merkel in the New Yorker. The article has many anecdotes and thought-provoking ideas, but one stuck with me. In November, 1999, the C.D.U. (Merkel’s and Kohl’s party) was engulfed by a campaign-finance scandal, with charges of undisclosed cash donations and secret bank accounts. Kohl and his successor as Party chairman, Wolfgang Schäuble, were both implicated, but Kohl was so revered that nobody in the Party dared to criticize him. 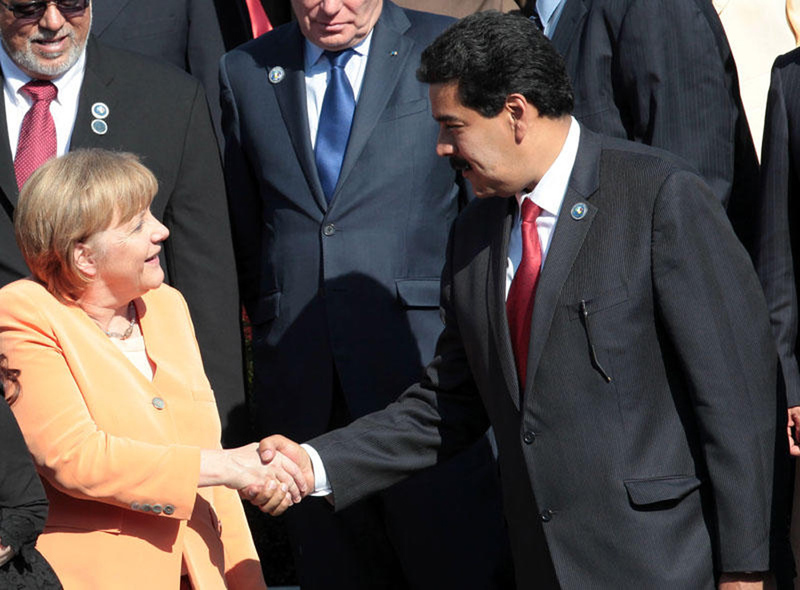 Merkel, who had risen to secretary-general after the C.D.U.’s electoral defeat, saw opportunity. She telephoned Karl Feldmeyer. “I would like to give some comments to you in your newspaper,” she said. “Power,” Kohl said, tersely. He told another friend that championing young Merkel had been the biggest mistake of his life. That is how political ambition goes. One day you’re on top of the world, the next day you’ve hit turbulence, and in a few minutes, someone has betrayed you. Even a politician as skillful as Helmut Kohl didn’t see this coming. It must be no fun being Nicolás Maduro. The economy is imploding, and juggling the demands of the different factions within chavismo is very difficult when oil is in the tank. His poll numbers are the pits, and he can’t afford a populist binge. Someone, somewhere inside the PSUV must be thinking this is their moment. A leader with little legitimacy is driving the country into a ditch, and it’s the perfect time for someone new, someone with weight, to satisfy his or her parricidal urges. I can just hear them saying that they had no choice but to act in defense of the Eternal Commander’s legacy. Who can it be, though? Some people I’ve spoken to believe the one guy this side of Diosdado Cabello that could challenge Maduro was murdered a few weeks ago. Is there anyone else? Well, that’s the thing about unlikely leaders such as Merkel – you never see them coming. The PSUV is not short on ambitious politicians, but ambition shouldn’t be their only driver. Their entire political survival depends on righting this ship. As each day passes without Maduro showing any signs that he understands the conundrum, the chances that someone in his inner circle will betray him by calling for his resignation increases exponentially. Call me overly optimistic, but failure to do this could mean the PSUV is headed straight to irrelevance. I know it’s hard to envision it, but I don’t think we’ve crossed the rubicon. Venezuela is not yet a country where a ruling clique can destroy the economy … and expect to get away with it. Somebody is bound to do something.